New for 2019! 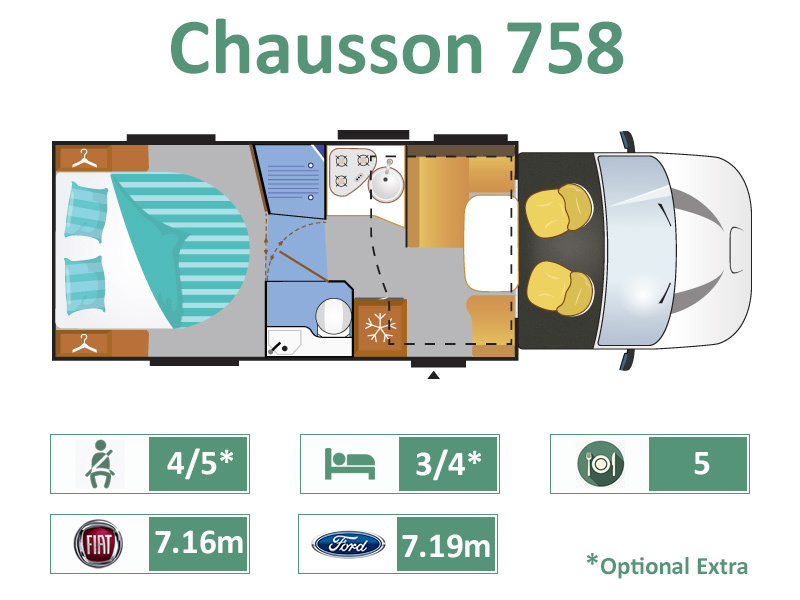 Chausson’s all new 758 model, available in Welcome, Welcome Premium and Titanium specification levels with an overall length of just 7.2 metres, (23` 7”). The electric drop-down bed over the front lounge provides a convenient and comfortable additional 2 x berths, and the rear height adjustable island double bed sits over the large garage beneath. Like the 747 model before, the 758 has washroom doors, as opposed to the louvred concertina doors found in some other models. Be sure to check out the secret under floor storage cupboards on both sides in the bedroom ideal for shoes, or maybe a security safe for those cherished possessions.